← Sandy Point Saturday run & 2 degrees of separation! I was considering a trip to Riverton, the nearest coastal town to Invercargill, when Geoff, who I met on the plane here (travelled the whole way from London on the same flights!) said he was going tramping in Riverton, his usual buddy wasn’t about, did I want to come? Sure, I thought! Riverton is a small place, one might call it a village. It’s a fishing town, sitting on a headland / inlet with a great view of Stewart Island and the amazingly long Oreti beach on the other side of the bay. 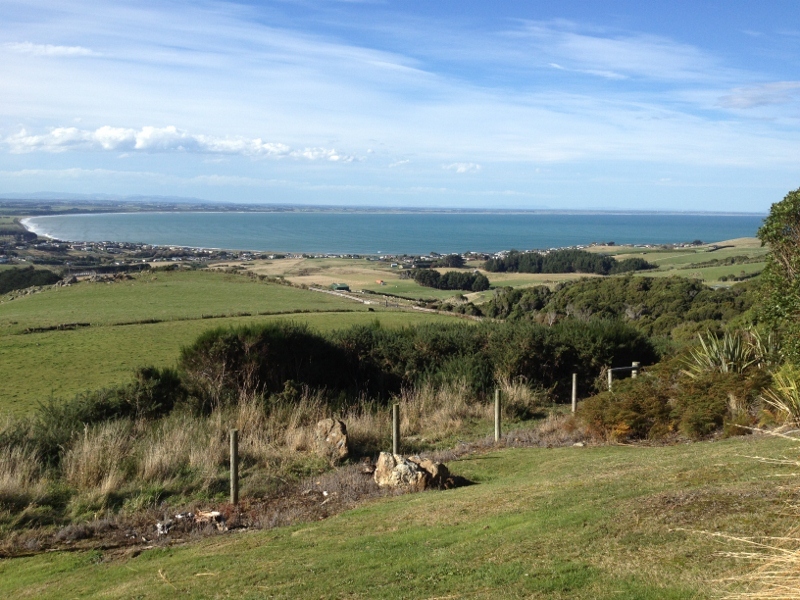 It’s around 40km from Invercargill. It has one small ‘main street’ which was, of course, all closed on Sundays (except for the art centre and organic store). We headed for a small track, that to be honest, looked like it headed to nowhere. Instead, if you persevered up the dusty track, it opened out onto a tarmacked car park and viewing point, from which you could set off walking around the hill / headland. This was Mores Scenic reserve on Howells hill. First we went up to the viewing point, from which you got a great ariel view of Pig Island and Stewart Island in one direction, and Riverton bay in the other. Then we headed straight down, to a beach area, where the cove was deserted, waves crashing off the shore. I stood for a while, looking at the amazing scenery all around me, so untouched, not a person in sight. Geoff talked about how much he loved this beach, had never seen anyone here, and we discussed how a similar location in the UK would be a well walked path where you would see a line of people walking through. You felt like you were the only one for miles. Incredible. The clouds moved overhead to reveal the hills of stewart Island, shining in the sun. Beautiful beautiful scenery all around. We headed back up through the bush back to the lookout point that we started from, and I am so glad that Geoff invited me out today. Another great location with a massive variety of trails, forest, meadow, hill, beach. Well worth the visit. This entry was posted in Sight seeing and tagged Mores Scenic reserve, Riverton. Bookmark the permalink.